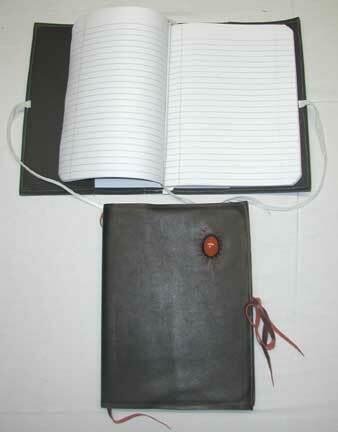 The Leather Journals found here are made with semi precious gem stones all signed and numbered by T.K. Hall. There is a limited number of these as the fantasy novel trilogy "A Perfect World" takes off. The inexpensive composition book is a perfect size for note writing, taking them to college, work meetings, or have as a journal. They have found their way into a variety of places, among a variety of ages, and now in a variety of Leather Journal covers. Click on Journals above to see In Stock items. Each journal comes with a FREE inserted composition book. Insert a new one into the leather sleeves. Place a leather strap toward the back of the book to hold the spine in place. Use the other leather strap to mark where you left off. Use the side leathers to tie a bow to keep it closed. Journaling can be an important part of life. When one writes their thoughts, it is putting it out of the abstract into the visual world that one can release it into the universe in front of them. List the right of what one might be looking at compared to the wrong of the subject. Weigh what you have written and look toward the right of the subject if it is good and for the best. If you have a "Dream", leave space that you can later write in what may evolve at a later date. Was it a dream or vision? Just plain writing for fun!